Your small group will provide a more intimate experience with your guide to discover less-obvious sights and hidden perspectives of Montreal's charming historic quarter. You will explore how Old Montreal and its St. Lawrence River Port were the most important and wealthy part of Canada for over 300 years, and how it has evolved into the dynamic and thriving (but less industrial) riverfront neighbourhood it is today. You’ll pass centuries-old architectural gems, cobblestone streets, and catch views of ships at dock. Feel free to poke your head into restaurants, galleries, bars, or shops as you pass by to take note for later pleasures. Your guide will be happy to share their recommendations and favorite spots as you walk through the beautifully impressive Crew Cafe co-working space inside the Royal Bank Building! To wrap it all up, we end the tour at the beautiful Neo-Gothic Notre-Dame Basilica, a must-see for every visitor to Montreal. 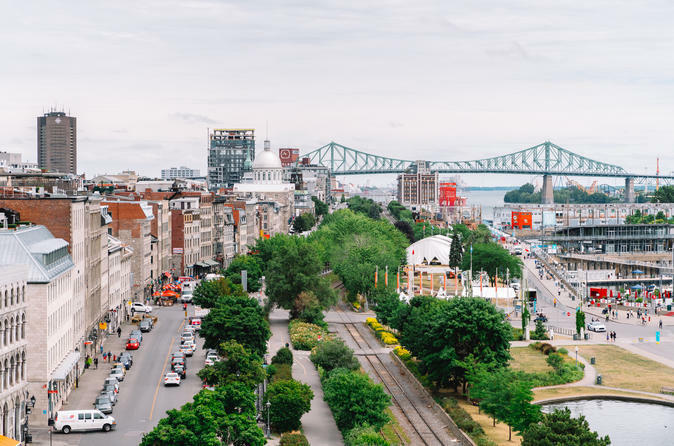 This tour is the ideal introduction to Montreal before wandering deeper into the out-of-downtown neighbourhoods.